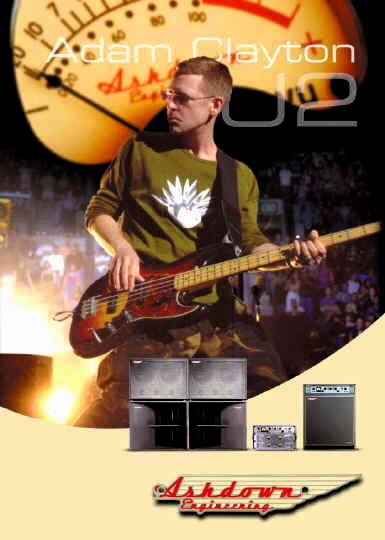 With the North American leg of U2's massive Elevation tour now past the halfway point, reports from the road suggest that Adam Clayton's mighty Ashdown bass rig continues to shake the continent with consummate ease, performing faultlessly night after night. "I spoke with Adam's Bass Tech Stuart Morgan just before the sell out show at Toronto's Air Canada Center" reports Ashdown main-man Mark Gooday. "He told me that Adam is delighted with the rig and that discovering Ashdown was like the end of a lifelong search - 'real bass amplification' he calls it." Mark originally sent a range of Ashdown heads, cabinets and combos to Dublin for auditioning prior to the recording of the 'All That You Can't Leave Behind' album. Suitably impressed, Adam chose an ABM C410H-500 combo to use in the studio and, when the time came to go on the road, Mark suggested that he should try the custom rig originally designed by Ashdown for bass legend John Entwistle".